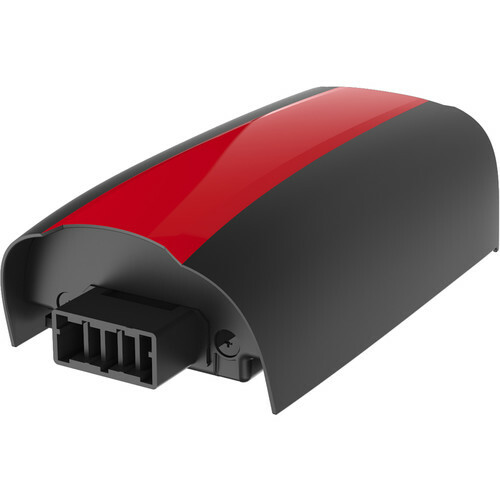 This Battery from Parrot is a replacement battery for your Bebop Drone 2 and its compatible Skycontroller. Like the batteries that came with your Bebop Drone 2 and Skycontroller, this is a 2700mAh rechargeable battery that provides up 25 minutes of flight time. Note: This battery is designed for the Bebop 2 Drone and Limited Edition Black Skycontroller. It is not designed for first-generation Bebop Drones or Skycontrollers. Box Dimensions (LxWxH) 8.8 x 5.25 x 1.4"
Battery for Bebop Drone 2 and Skycontroller (Red) is rated 4.4 out of 5 by 15. Rated 5 out of 5 by Vern from OEM BeBop 2 Battery I ordered two of these (white stripe) for some extra flight time with the Bebop 2.? I Charged them up completely and headed outside for a little fun.? Both batteries performed as expected....just like the ones that came with my BB2.? I usually get between 22-23 minutes out of mine as I'm not one to push the limits and the instant my indicator turns red, I land the drone and change out the battery.? Great price, fast shipping and as stated in the title....OEM, not a knockoff!. Rated 1 out of 5 by Anonymous from The product fails Unfortunately, this product presents a failure. In the first use, while I was flying my drone, it fell down all of a sudden. That is, the battery discharged completely in a matter of seconds. I charged it again and the same failure appeared. I haven't tried to use it again after that because I'll damage my drone. Rated 5 out of 5 by Anonymous from Good Deal Product was brand new and for the lowest price that I could find at the time. Delivered ahead of schedule. Product performed well and was the right color. I may be looking for another one of these soon at that price I might as well get an extra one. Rated 1 out of 5 by Serguei from Used battery sold like new Just purchased two batteries and I would say it's not cool to sell used batteries as new. When I received it, it was repacked in some wrapping but NOT as an original Parrot bebop 2. so B&H not cool. Rated 5 out of 5 by Anonymous from Great product, works as advertised. Parrot original product. Works well and the turn around time from B&H was excellent. I would buy this product again if and when I would need on. Rated 5 out of 5 by Roger from Quick Delivery Very happy with my new battery. Delivery was fast. It was packed very well and received no damage. Rated 5 out of 5 by Elwo from Very useful Great battery over 25 min experienence, Excellent to contine flight, you always want to fly mor!! These are brand new Parrot batteries. esta bateria le queda a BeBop 2 Adventurer Bundle?